It’s summer in London! Here’s some of the fun you can have this month in the capital. 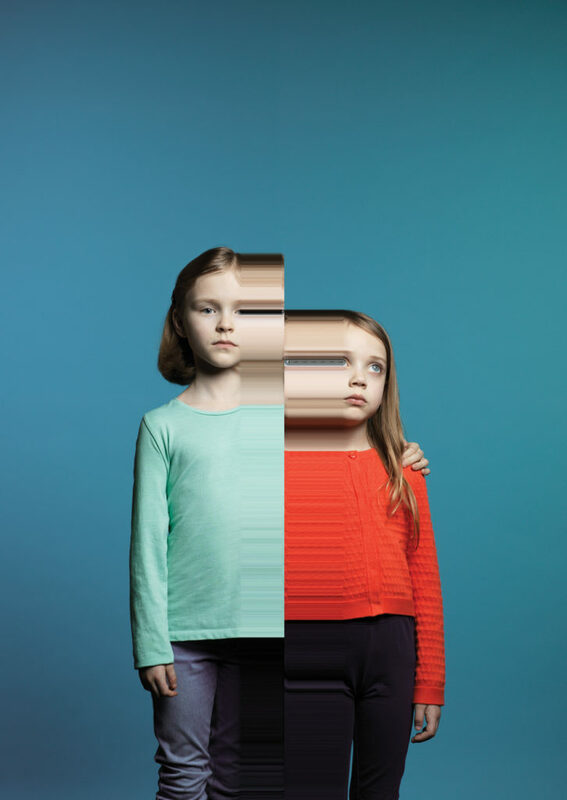 Directed by Rufus Norris, Mosquitoes by Lucy Kirkwood is on at the Dorfman Theatre within the National Theatre. It’s previewed since 18 July and is on until 28 September 2017. Olivia Williams (Agatha Christie, Friends, Ruth Rendell) is Alice and Olivia Colman (Midsomer Murders, Black Books, The Office) is Jenny. Tickets are likely to sell out so do try the National Theatre Friday Rush. Every Friday at 1pm an allocation of £20 tickets for shows in all three theatres at the National are released to buy online, for the following week’s performances. There will be something for every curious mind at the new Postal Museum which opens on 28 July 2017. It’s an interactive attraction with galleries with plenty of hands-on activities for all ages. And it covers unexpected and exciting stories, from pirates to escaped lionesses and a tiny piece of paper that changed the world. 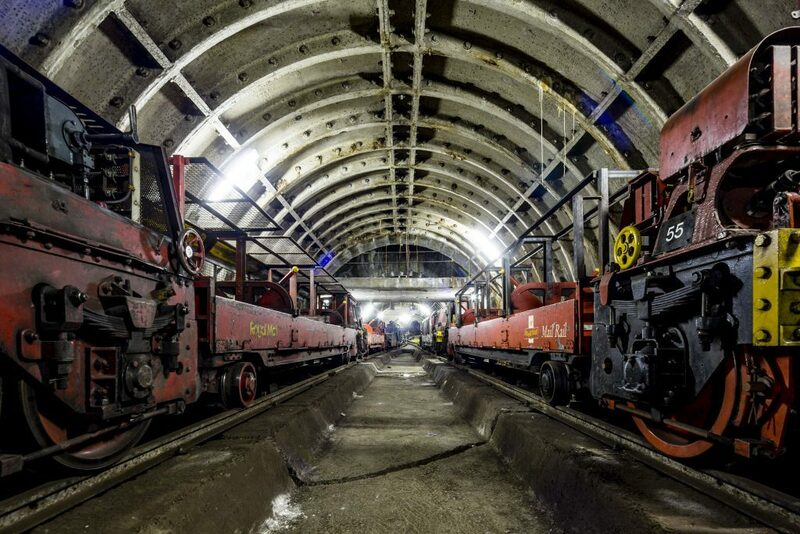 But what most people will want to visit for is for a ride deep underground on the miniature trains of Mail Rail. It’s a narrow gauge railway that was used for transporting the post from Paddington in the west to Whitechapel in the east from 1928 to 2003. It was the world’s first driverless, electric railway and was never intended for passengers. Yet, due to so much demand, a section of the track has been resurrected and it has been adapted for passenger use. Yay! The Mail Rail ride will be running from 4 September but this summer they have lots of summer holiday activities planned. The National Theatre’s River Stage outdoor festival returns this summer. On from 28 July to 28 August, expect free live music, guest DJs and vibrant dance and theatre to enjoy. This is a great place to soak up the sun and the atmosphere this summer. 28 – 30 July: The Glory: Expect a drag-fuelled weekend packed with fabulous back-to-back shows, surprise guests and parties. 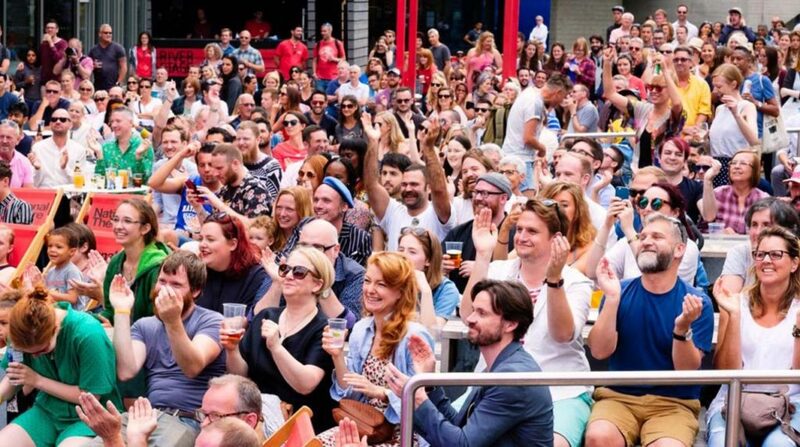 4 – 6 August: HOME Manchester: This centre for international contemporary theatre, art, film and music bring their eclectic line-up of performances, dance and special guest DJs to the outdoor stage. 11 – 13 August: WOMAD: The World of Music, Arts and Dance brings together artists from all over the globe. 18 – 20 August: Rambert: Solo and group pieces from this internationally renowned dance company. 25 – 28 August: National Theatre: A bank holiday weekend mix of live music, DJs, tea dance and family theatre, as well as an outdoor cinema screening. This summer, the Bank of England is issuing a new polymer £10 note, featuring Jane Austen. The new note is unveiled on 18 July, the 200th anniversary of her death, and the note will be issued in September 2017. To celebrate the launch, this new exhibition at the Bank of England Museum explores the Bank’s literary connections over the last three centuries and the many occasions when the Bank has found its way into fiction, inspired a character, influenced a plot or encountered an author. Stories from the City: The Bank of England in literature illustrates the richness of the Bank’s collections, presenting exhibits related to the lives and works of Charles Dickens, T.S. Eliot, Dr Johnson, Robert Browning, Samuel Pepys and George Eliot. It also reflects on moments when the Bank and the finances of London have been woven into classic works of fiction and explores the political and economic times in which stories were written. Exhibits are drawn from the vast collections amassed by the Bank since its foundation in 1694. Among the key exhibits is original hand-drawn artwork for the £10 note which featured Charles Dickens (in circulation from 1992-2003) and a special One Thousand Pound Note, signed by George Eliot when she visited the Bank in 1874 (on display for the first month of the exhibition 19 July – 19 August 2017). A particularly notable literary connection involves Kenneth Grahame, who worked at the Bank for thirty years. Grahame joined the Bank of England in 1878 at the age of nineteen, after scoring high marks in his entrance exam. He began in the Secretary’s Department, spending eleven years in the Private Drawing Office and rising through the Clerks’ ranks to become Assistant Secretary in 1894 and, four years later, Secretary. At thirty-nine he was one of the youngest to take up the post, which he held for ten years. Grahame wrote The Wind in the Willows during his years at the Bank but had left by the time it was published. 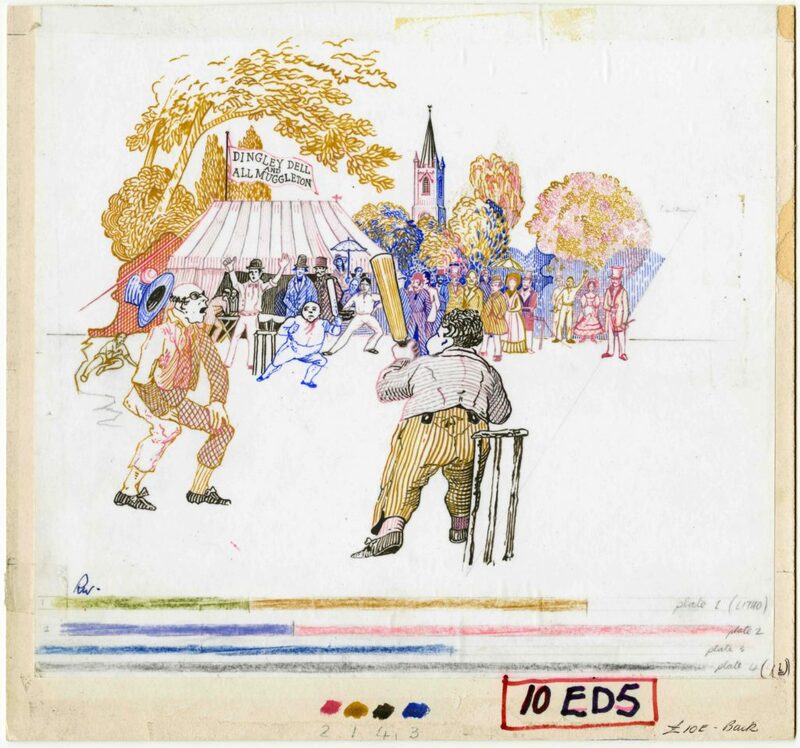 Original hand-drawn artwork for the £10 note which featured Charles Dickens, including a scene from the Pickwick Papers: the cricket match between Dingly Dell and All Muggleton. Drawn by Roger Withington, based on an illustration by R Buss. 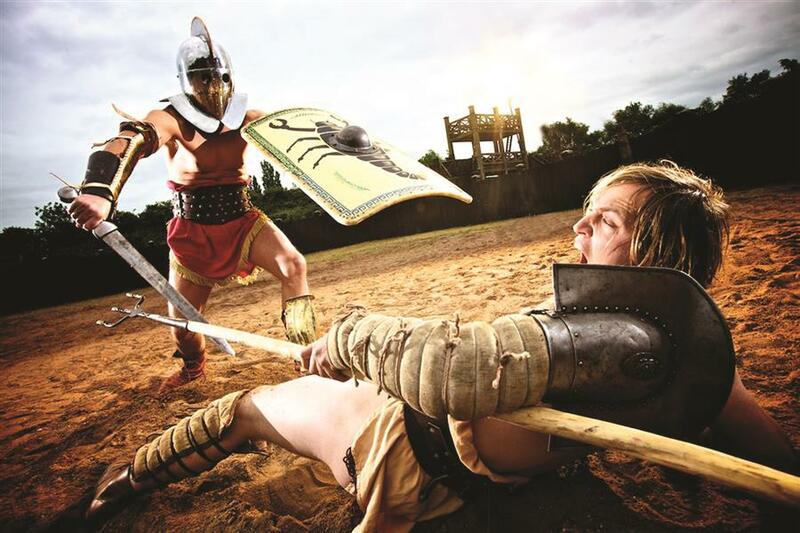 A corner of the City of London is becoming Londinium once again this summer, as the fiercest gladiators return to the site of London’s only Roman amphitheatre for Gladiator Games. Thirty years ago, the ancient remains of the amphitheatre were uncovered by archaeologists under the courtyard of the Guildhall. For the August bank holiday weekend (25 – 28 August), a new gladiatorial stadium appears and battles take place at the very site where Roman gladiators fought 2,000 years ago. Gladiators in full, magnificent battle dress enter the arena before packed crowds and fight a series of powerful battles – intense clashes of steel swords, brightly decorated shields, spears and shining armour. The audience get to become a big part of the action, taking sides and encouraging the emperor to save or spare each stricken fighter. I’ve seen this before and definitely recommend seeing the action. You soon get caught up in cheering the winners. It’s gory but still family-friendly. And after the battles, the actors usually stay to meet the audience and pose for photos. The Rose Theatre has Midsummer Night’s Dream on from 1 to 26 August. Shows are on Tuesday to Saturday at 7.30pm (Sunday Matinees at 3pm only). Set in a fairground, this 90-minute show is a fast-paced and colourful production of Shakespeare’s magical comedy romp. And we are told there are a few extra special surprises too. Returning to London in its 40th anniversary year, The English National Ballet perform Romeo and Juliet at Southbank Centre’s Royal Festival Hall from 1 to 5 August. The world’s greatest love story, Romeo and Juliet features Rudolf Nureyev’s inventive and passionate choreography from 1977 set to Prokofiev’s exhilarating score, performed live by English National Ballet Philharmonic. For Romeo and Juliet, English National Ballet welcomes Jurgita Dronina, who joins the Company as Lead Principal. (She also remains Principal with The National Ballet of Canada.) She performs alongside new Lead Principal Aaron Robison, who joined the Company in June. Guest Artist Josua Hoffalt, Étoile at Paris Opera Ballet, makes his debut with the Company performing in the role of Romeo. Further principal casting includes Lead Principal Isaac Hernández, Principal Yonah Acosta, and First Soloist James Forbat performing in the role of Romeo. Also performing in the role of Juliet is Lead Principal Erina Takahashi, Principal Laurretta Summerscales, and Soloist Alison McWhinney. This wonderful summer lunch cruise is available on 28 July and 25 August 2017. I tried the Laurent-Perrier Champagne Lunch Cruise in June and can tell you how special it is. 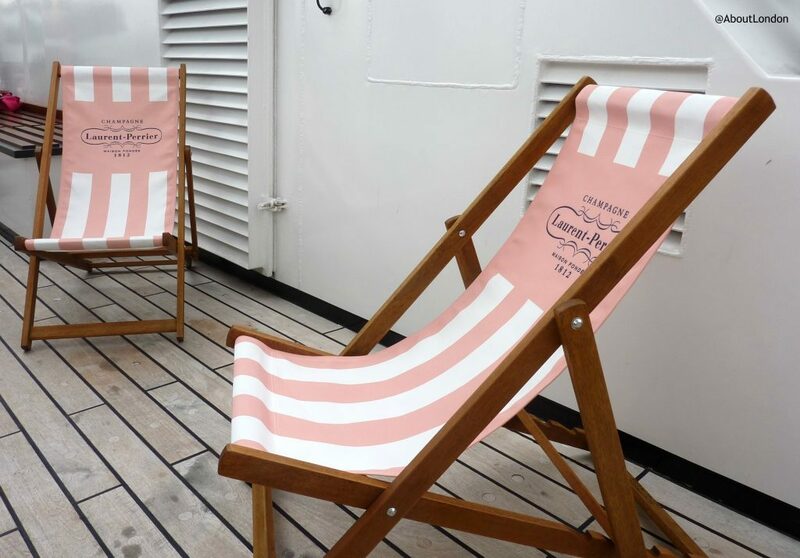 As you arrive you are welcomed onboard with a glass of Champagne which you can enjoy up on the Sun Deck and take in the sights of London. Then as the Silver Sturgeon departs Savoy Pier you move down to the River Room for a three-course meal as you cruise along The Thames. It is a wonderfully extravagant lunch onboard a luxury yacht with the best views of London while you dine. Seriously, what’s not to love? Tickets are on sale now. If you would like even more ideas for this month have a look at the Things to Do in London in August 2017 from Kensington House Hotel, our sister hotel. On 9 and 10 September passengers can enjoy journeys evocative of the early 20th century along with a pop-up vintage tea experience. For Vintage Summer Steam the Metropolitan No. 1 steam locomotive and the 1938 art deco Tube stock train will run on the Metropolitan line between Amersham and Harrow-on-the-Hill. Costumed characters will bring the history of past travel to life at Amersham station and on Saturday 9 September Vintage Summer Steam ticket holders will be treated to The Susie Qs, a 1940s close-harmony trio singing Andrew’s Sisters classics and performing the dance moves to match. On Sunday 10 September passengers can take a free heritage bus ride from Amersham Station to Amersham Old Town where the town’s annual Heritage Day will take place, with live bands and performances, market stalls and a children’s area and fairground. Scythians: warriors of ancient Siberia opens at the British Museum on 14 September. The Scythians were nomadic tribes and masters of mounted warfare, who flourished between 900 and 200 BC. For centuries all trace of their culture was lost – buried beneath the ice – but discoveries of ancient tombs have unearthed a wealth of Scythian treasures that are revealing the truth about these people’s lives. Following a critically acclaimed season at the National Theatre and a UK tour, Jane Eyre returns to the National Theatre this September. This innovative reimagining of Charlotte Brontë’s masterpiece is a collaboration between the National Theatre and Bristol Old Vic and is directed by Sally Cookson.